Recently, we had a little challenge going on at my favorite website, BakeSpace.com. It was a really interesting one, where we put all of the participant’s names into a hat and paired each other up with another member’s recipe box. My paired up member was Chris (Tyler’s Aunt) and I made a really good lentil soup from her cache of recipes (that blog will follow). My friend Spryte (Spyte’s Place) had to look through my stuff and decided on my cream filled cupcakes. She did a tremendous job on them, despite the fact that I wasn’t as descriptive as I should have been with the filling and it got more than a little goopy on her. It is my one fear with posting my own creations….I hate to have people go to all of the time and expense of making something that doesn’t turn out like it should because I didn’t communicate well. So here is my cream filled cupcake tale. Hopefully, this will make it easier the next time, for these truly are worth making again. Although rare, there were a few disadvantages in having a father who was a baker. The major issue, as I saw it, when I was 8, was that I was not allowed to indulge in various childhood treats that others took for granted. Chips Ahoy? Nope. Wonder Bread? Nada. Hostess Cupcakes? Not on your life. I had to enjoy these forbidden treats surreptitiously at my best friend’s house, since none of them could pass Daddy’s strict culinary standards. While my cravings for a Chips Ahoy cookie or a slice of Wonder Bread have long since gone away (what was I thinking? 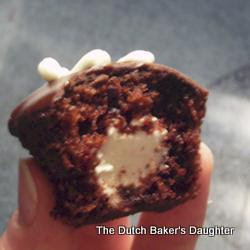 ), I am still a sucker for the treat of all treats—the Hostess Cupcake. I don’t get fancy with these. Just put all of the ingredients in a large mixing bowl and beat on medium speed for about 2 minutes until it’s all blended. The batter will be very thin. Line the cupcake pans with liners (this recipe will make 28-30 cupcakes) and fill the liners a little over ½ full. I use a large measuring cup for this part, since the batter is so thin. Bake them at 350 ° for 15 to 18 minutes, or until the top springs back when touched. Let them cool completely. Whisk the flour and the milk together in a small saucepan until the mixture is very smooth. Heat this over medium heat, whisking constantly, until it gets thick and bubbly. Remove from heat and place the flour mixture in a small bowl, covering the top with plastic wrap. Allow this to cool to room temperature (chill in the refrigerator if necessary). Then whisk some more...we don't want lumps. 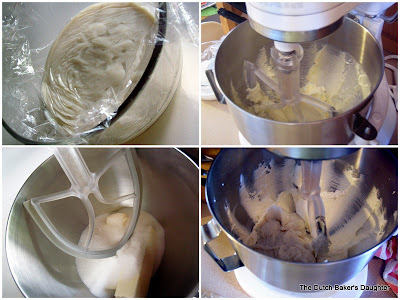 Place the butter and the sugar in a large mixing bowl (preferably, use a stand mixer). Beat at high speed for about 5 minutes until fluffy. Add the cooled flour mixture and the vanilla and continue to beat for 5-10 minutes or until the filling is very creamy and no sugar granules remain. Since I don’t have a splatter guard, I cover the mixer with a towel while it is beating, so I don’t find frosting flung across the kitchen. In my original recipe, I scaled back on the ingredients for the filling because I always have so much left over. But what the heck, go ahead and make the full batch and just use the leftovers to frost graham crackers. Yummy. Place the chocolate chips in a small bowl. Heat the cream in a small saucepan over medium/low heat until it just comes to a simmer. Pour the cream over the chocolate chips and let it sit for 2 minutes.Using a wooden spoon, stir the chocolate and the cream until well-blended. To assemble the cupcakes, begin by filling a pastry bag with the butter cream filling. Fit an appropriate tip on the pastry bag. I originally said to use a #5 tip. Sadly, my dog chewed up the good set of tips that I had (…sigh…I can’t keep anything nice) so I found a nice long plastic tip that works well. Push the tip into the top of a cupcake and pipe in enough filling that you see the top of the cupcake just ready to break. Repeat for each cupcake. When all of the cupcakes have been filled, prepare the chocolate ganache. Take a cupcake and swirl the top in the chocolate glaze, covering the top of the cupcake; repeat for each one. Let the cupcakes sit for a few minutes, so the glaze hardens and then pipe some of the leftover filling in a swirl over the top of the cupcakes. For an extra special treat, make the cupcakes in mini-muffin pans. So cute! I think even my father would have approved! They are adorable and so scrumptious, Cathy. I know exactly what you mean. Before I started writing my blog, I kept really basic instructions in my recipes (step further from my mom who mostly wrote the ingredients list and stop). They were so good!!! Everyone really loved them!!! Beautiful cupcakes! I'm sure they are 100% better than anything you can purchase. ooooh...yum! its almost 6:30 am and I'm craving your cupcake. Ooh I'm so excited! Now that you gave us step by step instructions I can try them! Yay! I love the tip for splattering. I just usually get batter everywhere! the pic of the mini muffin looks like you fill from the bottom not the top? I have seen both ways? How do you fill again? I used salted butter whoops....probably a little different tasting and I had to use a hand mixer but it still came out nice and fluffy and it doesn't taste half bad. I'm using it for filling on a two layer cake for my Dad's birthday. I can't believe I was paying my boss' wife to make these for me previously (filled cupcakes). I had no idea they were so easy. Thank goodness for Google or I never would have found this. Thanks! OMG!!!!!!!! !These are the most wonderful cupcake recipe I have ever found, and super easy to make. I was teaching my nephew who is 15 how to decorate cakes, and bake. We decided to make cupcakes, and he really enjoyed making your recipe as well as eating thm (of course). And with all your photo's and directions he found it so easy to follow the recipe, and the visuals where so helpful for him. hope you don't mind...I shared about your ho ho cupcakes on my blog...sharing the recipe and directing my readers here for DETAILED directions. There are no eggs in your cupcake batter, is the recipe correct?